Very Popular well maintained mid sized model situated in award winning age qualified community. Many activities & sports to enjoy with easy access to 3 state of the art clubhouses-like being on vacation. Many upgrades incorporated into this lovely home-diagonally set tiles, cherry wood cabinetry+large island,granite countertops,SS appliances. Attractive spacious floor plan, neutral decor, move-in ready. MBR & full bath separate from 2nd BDR. Just Reduced!! 1 story home with 3 bedrooms, 2 full baths, den and a 3 car garage. Located at the end of a cul-de-sac on a premium lot and in great condition. It doesn't get any better than this. Granite counters,tile on the diagonal, vaulted ceiling, upgraded cabinets, raised panel doors, gas fireplace, master with door to patio. Master has 2 closets. Low maintenance desert landscaping with a large side yard with room for a pool and more. Incredible views from the back yard of this beautifully maintained Delaware model. Crown molding,stylish fans in bedrooms,great room & kitchen.Freshly painted. Nearly new Bosch dishwasher. Laminate in bedrooms, neutral tile everywhere else.Plantation shutters through-out. Buyer to pay capitalization fee of 1/3 of 1% of purchase price. Buyer/buyer's agent to verify all. 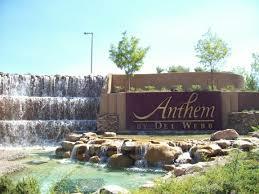 Beautifully-maintained home with access to all the amenities of Sun City Anthem! Open floor plan w/ two separate living areas, including a family room w/ gas fireplace. Large kitchen w/ island, walk-in pantry & SS appliances. Master bedroom suite w/ bay window & huge walk-in closet w/ custom built-ins. Many upgrades including 18 tile & plantation shutters. Oversized secondary bedroom. Backyard features a large covered patio & upgraded fencing. Gorgeous Upgraded 1 Story Home! Kitchen boasts Granite Counters, Upgraded Cabinets w/Roll-Out Shelves, Breakfast Bar, Nook, Recessed Lighting, Farm Sink, & Pantry. Spacious Great Room/Dining Area w/ Upgraded Porcelain Plank Tile Flooring, Gas FP, & B/I Shelving. Master Suite w/Bay Window, W/I Closet, & new Carpet. Master Bath w/Quartz Counters, Dual Sinks, Shower, & Sep. Tub. Two-Tone Paint, Rear Yard w/Covered Patio & Synthetic Grass, & more!